The National Science Foundation (NSF) has awarded $299,547 to Southern Illinois University Edwardsville to consider how the integration of informal science learning experiences, namely EarthCaching, in a course for pre-service teachers will increase their geoscience content knowledge and positive attitudes toward science, thereby strengthening their preparation to teach science in their own classrooms. The project, entitled “EarthCaching for Pre-Service Teachers: Examining Attitudes and Intentions towards Informal Science Learning,” is a collaborative endeavor led by principal investigator Sharon Locke, PhD, director of the SIUE STEM Center. Locke’s collaborators include SIUE’s Thomas Foster, PhD, professor in the Department of Physics; Shunfu Hu, PhD, professor in the Department of Geography; and Georgia Bracey, PhD, STEM Center research assistant professor. The research team is meeting the National Research Council’s call to the science education community to conduct further studies on how informal learning complements the formal classroom environment. During EarthCaching, participants visit local sites on their own, navigating to places with interesting geologic formations and natural processes. Through observations, they learn about the area landscape and how it formed. Locke’s previous research has shown that EarthCachers often participate for many years, because they are motivated to keep learning about the Earth. As part of their research, the team developed six EarthCache sites, including two on campus, one virtual and three in the surrounding area. These sites serve as learning opportunities not only for their students, but also for the community as a whole. Individuals are invited to visit SIUESTEMCenter.org/earthcaching for instructions on finding the sites and completing a corresponding educational activity. Those who find at least five of the six sites and complete the educational materials are encouraged to submit their responses to the SIUE STEM Center by email or online form. The first 100 individuals to finish the EarthCache exploration activity will receive a commemorative Geocoin. 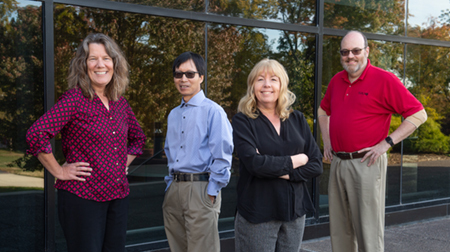 Photo: (L-R) SIUE researchers Drs. Georgia Bracey, Shunfu Hu, Sharon Locke and Thomas Foster.